Do you enjoy a good action strategy game? Well, you’re in luck! 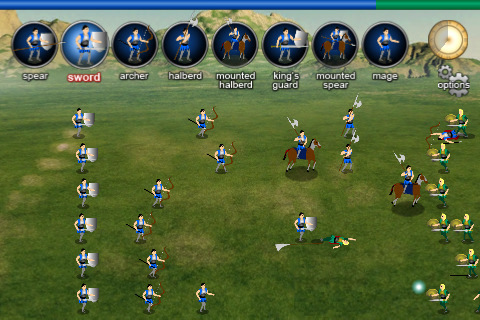 Greyhound Games has made their popular flash game, Warlords: Call To Arms, available for the iPhone, iPod Touch, and iPad. For those of you unfamiliar with the game, imagine WOW characters meets Age of War play and you’ll get a sense of the play involved. You’ll lead legions of humans, orcs, elves, trolls, and the evil undead into a battle to take over the world. Gameplay is highly addicting. You’ll spend hours controlling one of 8 races and capturing countries with units you assemble. You’ll start off with basic units and $500 in your pocket. As you battle creatures in other countries, you will win money for kills and capturing territory. With that money, you can visit the store and purchase additional units and weapon upgrades. So how to play? You’ll be able to select from different countries on a map. Each country will be occupied by different creatures and will range in difficulty. Select the territory (go for the easy ones first), defeat the occupying creatures, win, and repeat until all countries are captured. Just touch a territory that one of the yellow arrows points to with your fingers. You’ll then be shown a battlefield on the screen. You’ll also see information about the progress of your game on the territory bar at the top of the screen. All the units you have available to attack your enemies with will also be listed near the top. Select whichever unit you desire, and position them on any row in the battlefield by touching a spot on your screen. Your unit will deploy from the left side of the screen and battle the enemy creatures coming from the right side. There’s one other important detail to note: for every 20 kills, you will get a charge which allows you to send soldiers (of any one unit) into every battlefield row. Controls are easy and intuitive. I just wish there wasn’t a timer set for when a unit can be sent. Although, I suppose it’s there for a good reason, otherwise winning would be too easy. The tutorial for the game was also straightforward, although an interactive tutorial would be even better. The inclusion of online leaderboards via OpenFeint integration really makes the game. You can challenge friends, win achievements, or just brag about your latest victory. I also liked that the music and sound effects were adjustable because I wasn’t a huge fan of the loud sword clashing noises. On the same page, you can also set the feature to autosend units. This is better suited for the actual battlescreen. It would be great if users could decide when to autosend their soldiers during play. I’d also like to see developers add a feature that enabled users to play their own battle songs to gear up for war. It would be great if battles automatically saved if I get interrupted by a phone call or my battery dies. Graphics are also decent for a game of this variety. You won’t be amazed by the detail on the characters, but I think you’ll be able to enjoy the many different, colorful animations. I liked how the little solders thrust their swords, galloped on their horses, and marched in rows. Being able to choose from 8 races and 19 units made for great possibilities. And the 28 different countries had somewhat varied backgrounds so you won’t have to stare at the same field the entire time. Overall, I would recommend this game for action strategy addicts and amateurs. This is a great buy and ported well for the iPhone. If developers were interested in updating the game, I think they could incorporate user penalties for surrendering battles because users would be forced to develop better strategies and use their money wisely. I would also like the ability to customize the battle display so I can access my units from the lower left or right hand side of the screen. Having to access the units from the top blocks my view of the tiny iPhone screen because my fingers get in the way. Also, I’d love it if there was more of a storyline. The screen could show announcements or challenges from other enemies. This would really add to the gameplay experience. But for $1.99, Warlords: Call To Arms is a fantastic value even if developers don’t change a single thing. If you’re still unsure, check out the free Flash game available on sites like Kongregate or AddingGames to try it out before you buy. AppSafari review of Warlords: Call To Arms was written by Linda Ta on April 14th, 2010 and categorized under Action, App Store, Fun, Games, iPad apps, Strategy. Page viewed 6605 times, 1 so far today. Need help on using these apps? Please read the Help Page.